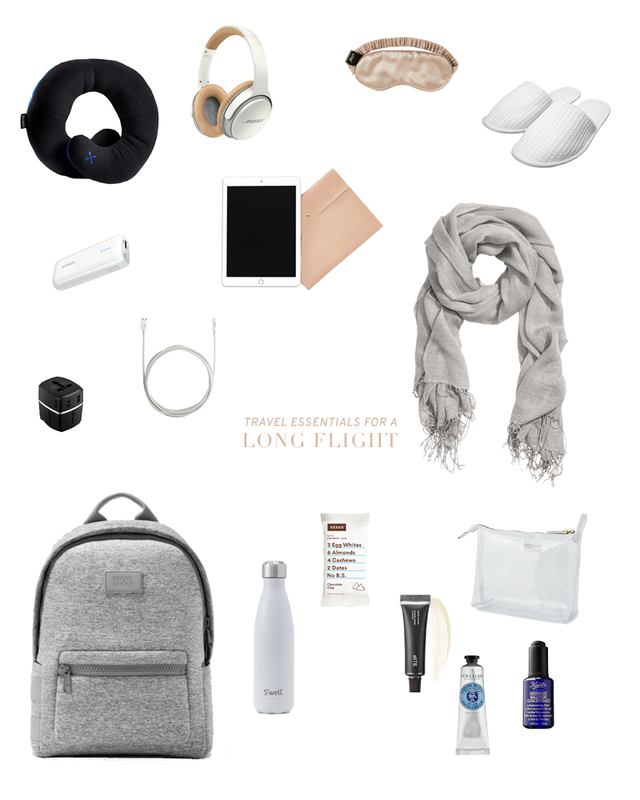 Neck Pillow • This is a must-have for setting yourself up for the most decent sleep you can get on the plane. I used this exact pillow on our 15 hours of flying time (roundtrip) and it was great! The way that it’s made, it can double up to add extra support to your neck or chin, depending on the position you prefer. Slippers • My feet always get very cold on planes, so you’ll never see me walk onto an airplane in sandals. I like to bring a pair of soft, fuzzy socks for these long flights for extra comfort and warmth. When it comes time to use the bathroom, I don’t want to mess with taking my big socks off, putting my thin socks back on, putting my sneakers on, etc., so bringing a pair of cheap flip flops or disposable slippers is the easiest way! Just slide them on to use the restroom – hassle-free! Compact Portable Charger • All the flights we’ve been on have had power outlets available at the seats, but in case it’s not working or is being used by another passenger, I like to have a back up power option to make sure my phone is fully charged before we land. iPad and Sleeve • I like to download new books I want to read, episodes of the show that we’re watching, and a few puzzle-type games, like Sudoku. The international flights we’ve been on have had plenty of options for movies, shows, and games, so this came especially in handy on our train ride. Lightweight Scarf • Back to being freezing on planes, a lightweight scarf is another thing I like to have on me. Not only for the function of keeping me warm, but I like to wrap my neck up for a little extra coziness before sleep. International Travel Adapter • This one is pretty self-explanatory! While the flights we’ve been on have had USB plugs to charge things like your phone, an adapter is necessary if you have larger electronics with a standard plug. I’ve also used this adapter in all of our hotel rooms to plug in my blow dryer and hair tools and it’s worked great! USB Cable • I always travel with a few backup cords – I’d hate to have to buy a replacement when I have 5+ laying around at home! Water Bottle • I like to fill it up just before we board, so that I have access to water whenever I need it. Plus, I like to carry it around with me when we’re on long days of exploring wherever we’re traveling to! RXBAR Protein Bar • I like to pack a few of my own snacks because I’m never quite sure what the options will be! Something like protein bars, almonds, or trail mix is usually my go-to. Lip Mask • The dryness in-flight is real. I like to keep my lips very hydrated! Hand Cream • I tend to wash my hands a lot, especially when I’m in public spaces, so they get quite dry. Compound that with airplane air, those suckers get very dry by time we land. Skin Serum • I don’t wear makeup on a long flight, so I like to have some sort of serum or concentrate to apply midway through and as we’re nearing our destination. It refreshes my skin and replenishes the moisture that has been sucked out while traveling. Zip Pouch • I like to bring along a little toiletry bag on the plane for things like makeup remover wipes, a travel toothbrush and toothpaste, sanitizing wipes, hand sanitizer, tissues, and the like. Everyone reacts to time changes differently, just like everyone reacts to lack of/poor sleep differently. Both Mike and I like our sleep. We’re better people when we have gotten adequate, quality sleep. Knowing this, we put sleep over nearly everything else when it comes to traveling. We’ve found a routine that works really well for us when it comes to acclimating to a new time zone, and it includes taking a nap. LISTEN. I know that there are a large number of people out there that subscribe to the idea that the worst possible thing you could do when traveling with a time change like that is to take a nap. Before we went to Europe last year, we were told that, no matter what, at all costs, do not go to sleep when you arrive at your hotel. We flew overnight, landed around 9 or 10am local time, made our way to out hotel, arrived in our room around noon or 1pm, looked at our bed, and promptly crawled in. We were zombies. As excited as we were to be in Paris, it literally hurt to blink, we were that tired. Knowing ourselves and how we function, we set our alarms for 2.5 hours and fell asleep before our heads hit the pillows. The alarm went off, we woke up easily and headed out to enjoy where we were! That night, we were able to stay awake until about 9 or 10pm and woke up at a normal time the next morning. I’m the person that will snooze my nap for hours hahah.. my husband always naps but I always try to stick it out. I totally agree with a scarf too! I use it as a blanket!